With the spotlight pointed on Mars thanks to the recent historic landing of the space rover Curiosity, Astralis is still the only wristwatch to contain a piece of the Red Planet – a fragment of Martian meteorite that travelled over 55 million kilometers before reaching the Earth ! To date, only 63 meteorite rocks found on Earth have been identified as being from Mars. 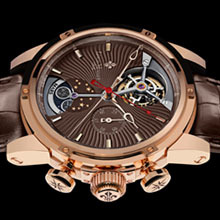 Louis Moinet has an exclusive collaboration with Luc Labenne, the most celebrated meteorite hunter. Astralis boasts a planetarium at 6 o’clock containing not one but four highly-polished rare meteorites – Dhofar 459, Itqiy, Sahara 99555 and Jiddat al Harasis 479 – respectively denoting the Moon, the Sun and the planets Mercury and Mars. Sahara 99555 it is the oldest known rock in the entire Solar System, estimated at 4 billion 566 million years, earning it the nickname the «Rosetta Stone» of our Solar System (though we are not certain it originates from Mecury). The Sun is symbolised in the planetarium by a sliver of Itqiy, a beautiful meteorite whose origins remain mysterious. All four of these fragments of extra-terrestrial rocks are unique and mounted on a finely-cut aventurine disk, evoking a starry sky making a one revolution per day. 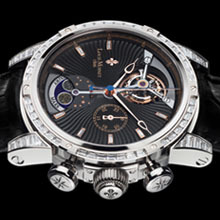 To celebrate the exploits of Curiosity, Louis Moinet has decided to present a unique set of four unique Astralis timepieces, with the dark brown, silver, dark blue and diamond-speckled black dials. The presentation case for each watch is a work of art in itself: A planetoidal sphere 21 cm in diameter created by sculptor Jean-Yves Kervevan, representing Mars, the Moon, Mercury and the Sun. into the crown. A sapphire glass caseback enables the viewer to admire the exclusive movement LM27, fully redeveloped based on a vintage Venus calibre. 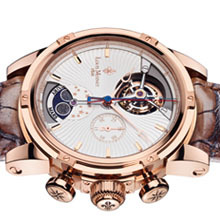 The chronograph column wheel and split-second ‘scorpion’ clamps provide ultrasmooth functionality and can be glimpsed through the display back along with a plate engraved with planets which, together with the gold chaton and blued screws, evoke a beautiful night sky. Presented in a resin-cast, planetoidal box handcrafted by artist Jean-Yves Kervévan. All four unique pieces – Mars, Mercury, Moon and Sun – are, in turn, presented in a leather-bound wooden cabinet.